CHAPEL HILL, N.C. – Blue Cross and Blue Shield of North Carolina (BCBSNC) announced today the conclusion of its second employee weight loss challenge – the 5 Ton Challenge. At the end of the six-month program, employees lost 8,317 pounds, surpassing by 546 pounds the amount lost in the same timeframe during 2012. In 2012, Wilson kicked off the year by challenging the company’s almost 4,000 employees to lose 10,000, or five tons, in nine months. Employees met – and even exceeded – the challenge by losing 11,301 pounds. In April 2013, BCBSNC embarked on the 5 Ton Challenge again – and employees lost over 8,000 pounds in six months. Over the course of the two-year program, BCBSNC employees lost a total of 19,618 pounds. Thirty five self-selected “Weight Warriors” led BCBSNC’s challenge. 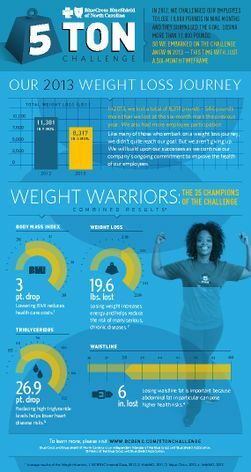 Throughout the program, the Weight Warriors shared stories and experiences with other employees through videos, personal blog posts, discussion board updates and news articles on the company’s intranet. “Weight loss isn’t a magic pill to make you a different person; it does make you a healthier version of yourself,” said Weight Warrior Dwan Richmond. While participation was voluntary, 46 percent of employees participated in this year’s challenge. In 2012, 40 percent of the BCBSNC workforce participated. To conclude the challenge, BCBSNC will donate $8,317, $1 for every pound lost during the challenge, to Bridge II Sports, a local charity that gives people with disabilities the opportunity to participate in sports and stay active. To learn more about the 5 Ton Challenge, visit www.bcbsnc.com/5tonchallenge. Or meet the Weight Warriors by visiting BCBSNC’s YouTube channel (http://www.youtube.com/user/bcbsnc) or checking out the BCBSNC Facebook page (www.facebook.com/bcbsnc).